Travel to Blissdom went well…for me. Unfortunately, the snowstorm that hit the northeastern U.S. kept some registrants from attending. I can’t imagine how disappointed they must be. The Opryland Hotel has their own shuttle service that was $30 round-trip with the Blissdom conference discount (normally $40). There were a few other conference attendees on board and we started networking before the bus ever left the airport. Check-in was my first experience with the wonderful guest service at the hotel. I’ll have another post with more on the hotel later. After what seemed like a longer walk than it really was, I found my room (okay I got help from an employee). I went straight to registration to make sure I had a name badge for the evening kickoff party. The line wasn’t too long and I was right behind Serryus Mama who was a familiar face from BlogHer. 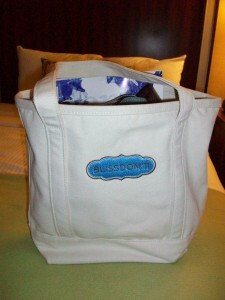 In addition to a badge, every attendee received a Land’s End bag filled with goodies from various sponsors plus the conference booklet. An upcoming post will include more about these gifts (aka swag). 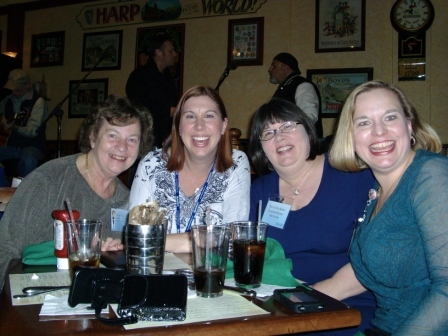 There was a short break to unpack and change before meeting Heather from Inexpensively, Denise from Shopper Strategy and Sarah from Sewing Business for a bite to eat at the Findley Irish Bar. It was good food and great company to start off the conference. The first event was the Blissdom Kick-Off Party at Water’s Edge in the hotel. There was a signature drink, the Blissdom Blossom, which actually had an edible flower in it and was very popular. They were pretty, tasty, and very sweet and I wished I thought of taking a picture for you! This venue is on the “river” that runs through the property and had a great atmosphere at night. There were food stations scattered around with mini-burgers, nachos, fresh fruit, chocolate covered strawberries and more created by chef George Duran and sponsored by Con-Agra Foods. I met Heather from Cincy Savers, Lynda from Seams Happy and Nathan from We Use Coupons. You might remember Nathan from the Extreme Couponing show on TLC. Time flew and it was time to head out for the next event of the evening. 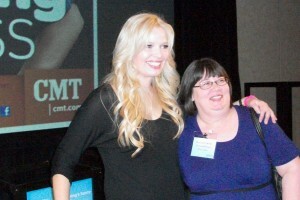 Country Music Television sponsored a screening of their new show, Working Class, starring Ed Asner and Melissa Peterman. 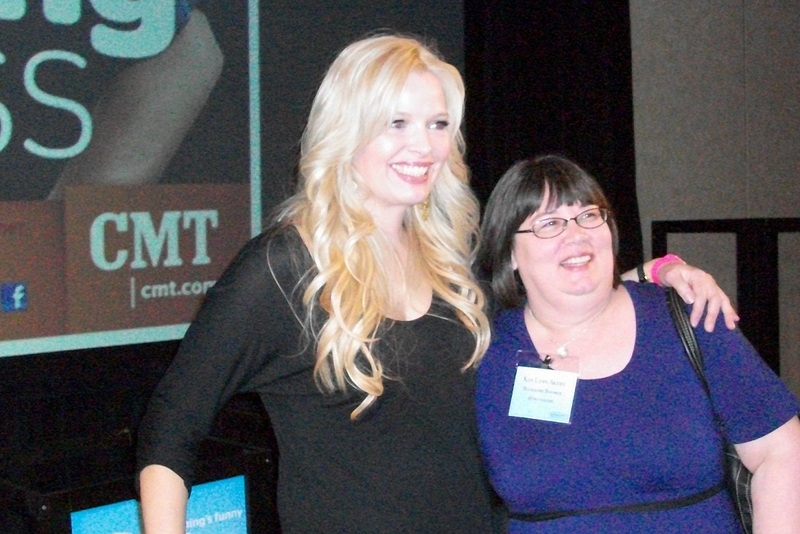 After hitting the bar and loading up on cupcakes and/or popcorn, Melissa Peterman herself introduced the show. My husband was a fan of Reba where Peterman’s role was Barbara Jean so I knew she is very skilled at situation comedy. This show is a great fit and I heard a lot of laughter during the episode (including my own). The Q&A session with Melissa that was very touching. Melissa kindly spoke to and took pictures with all who wanted to wait. She seems like a wonderful person and I am going to have to add her show to my DVR schedule. This ended the night for me (after all it was midnight when I got to my room) so I could be ready for day two of Bliss! Thanks, Melrose. I will be writing at least two more posts on the conference. It sounds like the first day was great fun! I can’t wait to read about more of your fun! Lisa, it was fun; I was hoping for more content than I got out of it. Sounds like you had a great time! How many people attended total you think? I think there were 500-600. I never did hear an official number. Loved meeting and walking with you around the beautiful Gaylord. The highlight of my trip was the people I met, and you were one of the best! I’m writing my post right now and will send you a link when it’s done. Kelly, thank you so much. I enjoyed meeting you and Cammy on that walk as well. I can’t wait to read your post. The event looks like it was a lot of fun!